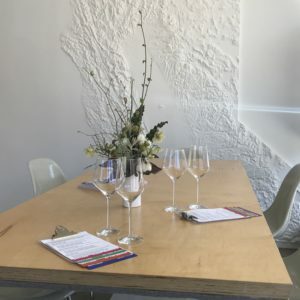 Spring brings many welcome things to Napa Valley: warmer weather, an abundance of wildflowers, and expanded hours at the Outland Tasting Room in downtown Napa (at 920 Franklin Street). This 3-wineries-in-1 tasting room features delicious wines from POE Wines, Forlorn Hope and Farella Vineyard. Starting this month, they are now open Thursday to Monday from 1 pm to 7 pm. The wines produced by those three wineries may cover an array of varietals, but the winemakers share a common belief that wines should be produced with minimal interference and allowed to show their unique varietal characteristics. The founding winemakers of the Outland Tasting Room are Samantha Sheehan (POE Wines), Matthew Rorick (Forlorn Hope) and Tom Farella (Farella Vineyard). On any given day your white wine tasting choices could include Sauvignon Blanc, Chenin Blanc, Sémillon, Pinto Gris and Chardonnay. For red wine, you’re likely to find Pinot Noir, Grenache, Malbec, Merlot, and/or Cabernet Sauvignon. The tasting room itself has an open, contemporary design and was created to allow the Napa community, and visitors, to experience high quality wines while also fostering wine education. After being inspired by the wines of Burgundy and Champagne, Samantha Sheehan founded POE Wines in 2009. Here, she tries to create wines which are vineyard specific, age-worthy wines reflective of the terroir of California. POE Wines are vinified with minimal intervention without any additives and a judicious use of sulfur. Each wine is made in very limited quantities. FYI, the name “POE” was inspired by the ravens which inhabited Samantha’s backyard as she grew up (and Alfred Hitchcock’s “The Birds” was actually filmed nearby). Forlorn Hope was founded in 2005 by Matthew Rorick, who believes that winemaking revolves around stories. He found his passion for food and wine at his grandfather’s table, where his grandfather frequently shared a bottle of wine, a meal and good conversation. After graduating from UC Davis, Matthew worked on a number of winemaking projects in New Zealand, South Africa, Chile and California. The Forlorn Hope estate vineyard is in Calaveras County, just outside of the town of Murphys in the Sierra Foothills. Matthew also works with a number of growers to locate plantings which may be considered “misfits,” either because the sites are uncommon sources for grapes or the varietals are more eclectic than what might be expected for California. 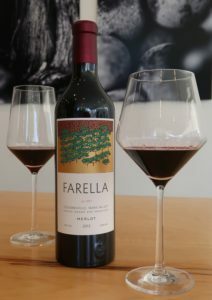 Frank Farella (Tom Farella’s father) originally founded Farella Vineyard in 1977 (then known as Farella-Park Vineyards) and the first wines were produced in 1985. The winery is based out of Coombsville, the newest appellation in Napa Valley, which is located just east of the City of Napa. Farella Vineyard is responsible for planting the first Cabernet Sauvignon vines in Coombsville and producing the first Cabernet wine from this district. Tom was inspired to enter the wine trade after a family trip to France and some prodding by this father. He has spent time honing his craft in Sonoma, Burgundy, Oregon, and of course, California. POE Wines produces traditional Champagne method sparkling wines, Rosé, Chardonnay, Pinot Noir, a nouveau wine made from Pinot Noir, and several Vermouths. The wines are vineyard-specific and provide wonderful examples of wines produced from grapes grown in appellations such as Mendocino Ridge, Anderson Valley, Sonoma Mountain and Napa Valley. Once per year, POE Wines conducts a nouveau release and celebration which teams them with a local celebrated chef to create a meal for the local wine community and their customers. In keeping with the traditions of Beaujolais Nouveau, the date of the celebration is usually set sometime around the third week of November. All of the wines are refined, restrained and reflective of place. 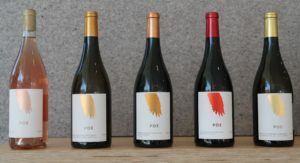 Forlorn Hope is a champion of less-common grape varieties in California and produces wines made from grapes such as Sémillon, Carignan, Alvarelhão, Mataro (Mourvèdre) and Verdelho among many others. 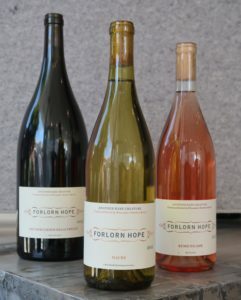 The grapes for Forlorn Hope’s wines are sourced from appellations such as Suisun Valley, Russian River, Mendocino, Amador County, Calaveras County and Carneros. New barrels are never used in the cellar here, and some barrels actually date back to the 1997 vintage. Each of Forlorn Hope’s wines may be put through different fermentation methods in an effort to treat each wine as naturally as possible. The resulting wines are delicious and have a real freshness at their core. Farella Vineyard focuses on more traditional varietals for the Napa Valley and produces fantastic wines made from Sauvignon Blanc, Merlot, Cabernet Sauvignon, Malbec and Syrah. All of the wines are made from grapes grown in their Coombsville Estate vineyards which are planted to 26 acres of vines. The winery only makes one white wine, a very refreshing Sauvignon Blanc. In addition to single varietal wines, Farella also makes a top tier Bordeaux blend called “Alta” (the 2015 vintage was comprised of 63% Cabernet Sauvignon, 33% Merlot and 4% Malbec). The wines are elegant, well-balanced, aromatic and reflect the relatively cooler weather in Coombsville which is moderated by its proximity to the San Pablo Bay. 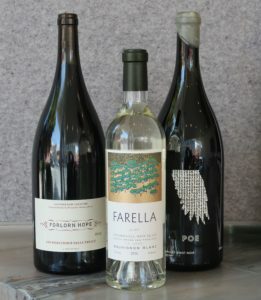 We have really been impressed by the wines of POE Wines, Forlorn Hope and Farella Vineyard. We encourage you to try wines from each of the producers and then purchase and lay a few bottles down to experience the wonderful nuances that a little cellar time will produce. All of these wines are well-structured and have the potential to keep your palate interested for years to come. The Outland tasting room is on the Westside of Downtown Napa. They welcome walk-in guests (parties of 6 or less) for tastings Thursday through Monday between 1PM and 7PM (now that Spring has arrived). Reservations are required for parties of 7 or more which can be made via phone, email or on the tasting room’s website. All tasting experiences are seated and the environment is casual, modern and friendly. Outland offers a variety of wine flights which typically include four wines from any one of the wineries (POE Wines, Forlorn Hope & Farella Vineyard). Or, you can opt for the “Outland Flight” which offers one pre-selected choice from each of the three wineries. Then, you get to select a fourth choice from all of the wines available on the individual producers’ flights. The cost for the wine flights currently ranges from $32 to $36. Wines may also be purchased by the glass or bottle. In addition to being a wonderful place to try more traditional varietals for the Napa Valley, Outland is a great place to discover interesting and different wines which are not as common here. This may be your chance to try wines made from St. Laurent, Picpoul, Graciano, Mondeuse, or others as well. The Outland Tasting Room is located at 920 Franklin Street in the heart of Downtown Napa, between First and Second Streets. If you are driving, it is usually easy to find parking on the street or in nearby lots. You can contact Outland at (707) 227-1277 or via email at appointments@outlandwines.com. For parties of 7 or more, reservations can be booked via phone, email, or through their website’s TOCK link. If you are staying in downtown Napa, Outland is very close to the Andaz and Archer Hotels, and easily walkable from most of the downtown Inns and Bed and Breakfasts such as 1801 First, Blackbird Inn, McClelland-Priest B&B, Napa River Inn, and R Inn Napa. If you are coming from outside of Napa, Outland is about 15 minutes from Yountville, 30 minutes from St. Helena and about 1 hour and 15 minutes from San Francisco. If you plan to visit the Outland Tasting Room, you can also see our recommendations for other wineries and restaurants in the area such as Robert Craig Winery and John Anthony Vineyards. In Downtown Napa, nearby restaurants include ABC (Alexis Baking Company), Angèle Restaurant & Bar, Carpe Diem Wine Bar, Compline, Monday Bakery, Napa Valley Bistro, Oenotri, Tarla Mediterranean Grill and TORC. 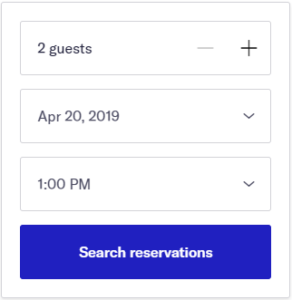 Or, you can follow the drop-down menus above to see our Favorites by Wine Region for suggestions elsewhere in the Napa Valley, or other wine country travel destinations. 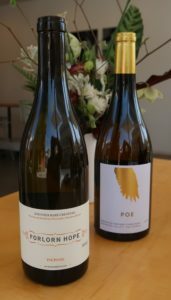 We, the Two Guys From Napa, highly recommend that you plan a visit to explore POE Wines, Forlorn Hope & Farella Vineyard at the Outland Tasting Room for another wonderful tasting experience in the Napa Valley. Cheers!